bar area, restrooms, large back patio and park setting. Perfect for weddings, parties, graduations, memorials, reunions, fundraisers - any event! Monday through Thursday is $100 an hour. A $700 refundable cleaning deposit is required for any day. 10% off for all SHA members. Join for as low as $68 by visiting our Membership page. Your guests will enjoy the adjacent bar area with its own intimate seating arrangement. This bar is complete with sink, fridge and freezer. The bar’s side window opens to the commercial kitchen, which has a gas stove, oven, griddle, sink, microwave, serving area and multiple refrigerators and freezers. Concrete walkways surround the front entry, large back patio and side entrance to the kitchen. Large heritage oaks and other shade trees line the front and back of the property. Spacious and perfect for garden weddings and events! There is free onsite parking for about 60 cars. 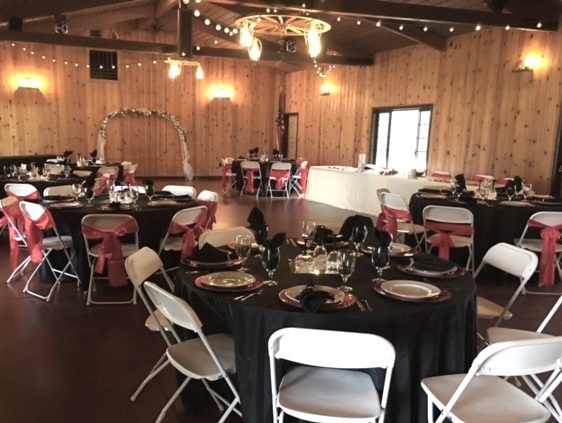 The large hall is perfect for dining, dancing or an indoor ceremony. The rustic knotted pine walls are as picturesque as the antique wagon wheel light fixtures overhead. Tables and chairs included at no extra cost - 16 (5’) rounds and 13 (8’) rectangles - plus white chairs for up to 150 persons. Who do we contact at the SHA park for Clubhouse viewing/rental appointments ? Appointments are scheduled through the Clubhouse Caretaker, Mr. Mike Walker. Please contact Mike directly regarding all Clubhouse rental matters by calling the FSHA Clubhouse Line at 916-223-0011. Mike will be happy to make an appointment to show you the Clubhouse and answer your questions. Once you have paid your deposit and contracted the Clubhouse for your event, Mike will be available to open and close the Clubhouse for you before and after your event and be available for any urgent matters during your rental period. The FSHA Board of Directors Clubhouse Committee oversees Clubhouse Maintenance and Management. You may contact the Clubhouse Committee Chair, FSHA President Missy Worthley by leaving a message at the FSHA Office Line at 916-470-1337. We make every effort to return calls within a business day. The FSHA Board of Directors Clubhouse Promotion Team oversees Clubhouse Promotion and Advertising. You may contact the Clubhouse Promotion Chair, FSHA Secretary Michele Saylor, by leaving a message at the FSHA Office Line at 916-470-1337. We make every effort to return calls within a business day. When do we give the deposit? At the time you sign the contract and reserve the date, the deposit is paid in full. It is refundable as long as you meet the contract. Stay away from the street and businesses across the street and the barn/trailer area. When can I set up? We can open for access at 8:30 am. Can I decorate the night before? Not unless you rent the hall for a 3 hour min, add your insurance, + another $350 deposit. We will not do any clean up and it will be monitored by on-site employee. They will let you in and depending on how many hours $300 min, $100 an hour—come back and lock up. Any variation can lead to losing your deposit. What time do we have to end our event? 12:00 midnight –because you have to clean the hall. Pick up all garbage inside and outside. Put away all chairs and tables, clean off counter tops, clean bathrooms of debris, sweep, and make sure all garbage is outside in trash containers. The clubhouse must be totally cleaned and completely vacated by 2:00 am. Can we bring our own horses? You can tie them to your own trailer. Just make sure your insurance will cover them if anything happens at your event. SHA will not board them for you. Make sure your insurance covers this ! What happens if something breaks down during the event? By the kitchen door, there is a list of vendors you can call—at your expense—to fix it, 24 hours a day. How many parking spots do you have? Estimated 60, as it depends on the size of car and time of year. The area can be soft due to rain. You can park from the fence to the clubhouse, 3 cars deep. Rentals? Delta Party Supplies-across the street: will give 15% discount on renting anything you need except linens. Who cleans? You do. Bring extra bags. Trash cans are on site but if you have a huge party with food—it all must be in bags. Sweep the floor, wipe the counters, clean out refrigerator. Clean the outside including parking lot. Bring a flash light. All chairs and tables must be put away. Be sure that all trash is put in the dumpster located on the west side of the SHA park driveway near the horse trailer parking before you leave. You also have the option of hiring a crew to clean for you - at your own risk. Arrangements must be made with the Clubhouse Caretaker (listed in your paperwork). Will I get my deposit back? If anyone goes outside of the area of the clubhouse—NO, if the hall is left dirty-NO, if anything is on the ground outside-NO, if children are unattended–NO, if litter, however small (including bottle caps and water bottle lids, confetti, cigarette butts) must be picked up from the grounds, parking lot, dumpster area or patios/porches or if anything is left behind that must be removed from our interior or exterior walls (including tape) - NO. Please be very careful and allow yourselves plenty of time for clean-up with good lighting to increase your chance of getting your deposit back - we would much rather return your deposit that have to pay a service to clean up after you !